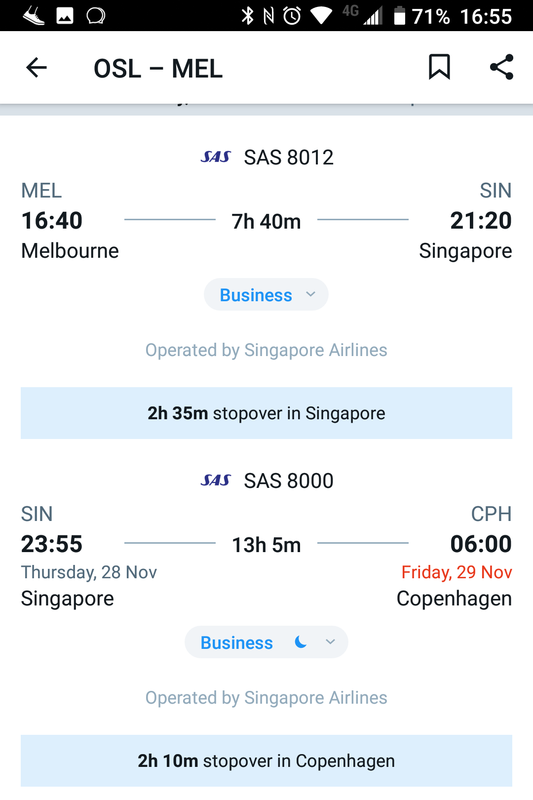 I'm not sure if this strictly qualifies as a deal, but for those looking for early bird prices for trips to MEL/ SYD in late December from EU, I just booked a family trip (2 adults, 2 kids) OSL-CPH-SIN-MEL return in SQ business class (777-300ER and 380-800 mix) for £7,588 (21 dec out, 04th Jan return) which comes out at just under £1,900 per head. 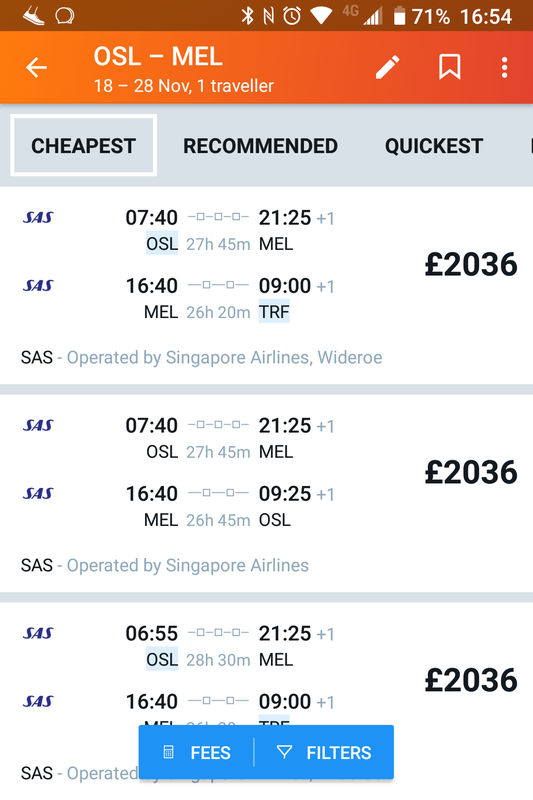 If I'm honest, I did it direct on Singapore Airlines website for £200 more so don't need to worry about travel agents if any issues, but the best pricing seems to be on mytrip.com as screenshot. Nice spot OP - however their (Singapore) website does not go to 04/01/2020 - did you manage to get booked to that date? The above screenshot is from a third party agent, not from SQ. 04/01/2020 was likely chosen randomly by the OP to illustrate the deal; it does not mean (nor has the OP indicated) that these precise dates are the ones used on the separate, unillustrated, actual booking made by the OP. My personal travel dates are 19 Dec and 02 jan. I was checking for other dates to make sure it had wider availability too. Sorry about the confusion! I've seen this on Kayak but for some reason the outbound SAS coded flights are in Premium Economy so be careful when booking the cheapest! 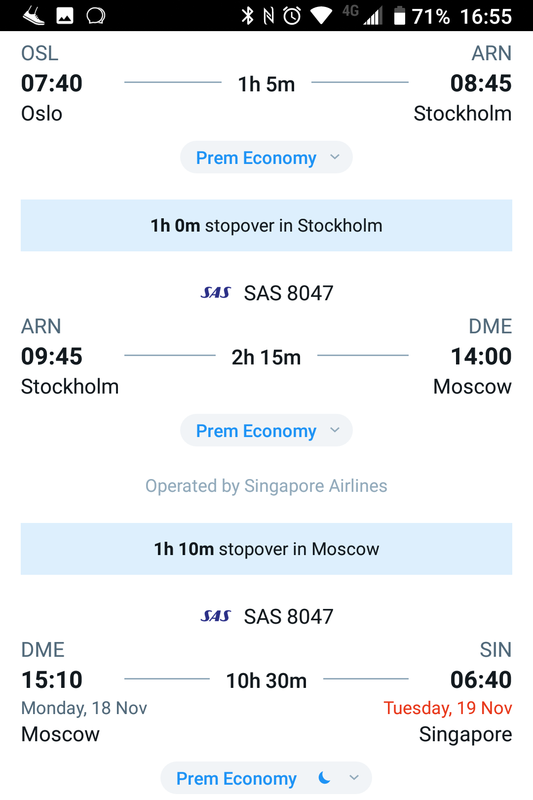 I’ve not yet been able to choose seats on the SAS flights OSL-CPH (and back) segments as it’s a partner flight to SQ so can’t confirm for sure but i did choose seats already for CPH-SIN-MEL (and back) and at least if booked throughout SQ I can confirm they are business class ( D fare codes). Didn’t try Kayak though as I found it via Momondo originally. Yeah, there is no business class on SK short haul flight; only SAS Plus (Premium Economy). However for a short flight OSL-CPH I'm sure you will survive. SAS Plus provides full access to SK lounges at OSL and CPH. Then the answer should be obvious. A third party vendor may - and can , and does (see above) - offer flights on 04/01/2020 even though SQ.com itself doesn't. This looks like a nice price but I might need some convincing on how sq compares with other operators. I saw a video on YouTube that put me into doubt. I suppose SQ is between BA and QR in terms of J offering? I very much like QR and not very much BA. You got to be kidding/clearly you have never flown SQ in C class. SQ C class is way beyond BA and QR in terms of soft and hard product. Nowhere near comparable. RollAnotherFatOne and choosethedrew like this. What I meant was that the whole of the outbound was showing as PE and the return was in Business. But why would you fly via ARN/DME when via CPH on B77W is an option (admittedly not 7 days a week)? I flew SQ back to ARN from MEL 2 months ago, and between that and BA there is absolutely no comparison, SQ wins hands down. I have not flown QR J yet unfortunately so cannot comment. I have read that people think that the SQ J seat is restrictive for sleeping, but I am 6.2 and had no issues at all getting comfy. And if you are lucky you can score one of the bulkhead seats, as I did on SIN-AMS.